At IIAS, we are continually investing in the best facilities for our students. All IIAS campuses are equipped with latest audio-visual equipment, networked computer labs, Wi-Fi enabled classrooms, student common rooms, state-of-the-art kitchen, bakery and confectionary units, training restaurants, front office labs and model guest rooms. Our experienced Help Staff are there to support you for any help that might be required. IIAS puts a strong emphasis on learning outside the course material, through use of case studies, journals and reference books. All campuses have modern libraries with large volume of books, periodicals and latest course oriented journals. The digital library offer a wide range of 2500 book of around 800 titles, 16 combinations of National and International Journals and periodicals to provide food for the brain. The library also provides Wi-Fi facility, photocopy, spacious disturbance-free reading area, lending facility and highly user savvy automated library package- all of which conducive to gaining knowledge. IIAS Siliguri boasts of a state of the art language lab with BPO-grade language training software. Language classes are delivered via audio-visual means and all systems are equipped with high-quality headsets and microphones. Students have a media player for listening to audio and recorded speech. Teachers control the learner’s computer via the teacher’s console and guide the student’s learning. The purpose of a language lab is to involve students to actively participate in language learning exercises and get more practice than otherwise possible in a traditional classroom environment. Each of the IIAS campuses have its own computer labs. All the PCs are equipped with Windows OS and are connected to the internet. System administrators provide support to students during office hours in case of any problems. 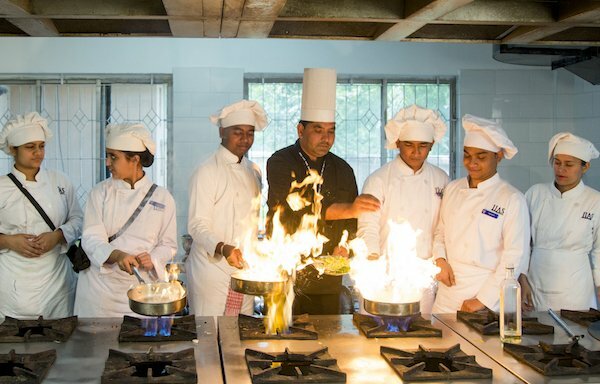 Being one of India’s top Hotel Management institutes it is imperative that all IIAS campuses are equipped with state-of-the-art, industrial grade food production facilities for training budding chefs and bakers. The lab offers basic and advanced uses of food, preparation as well as experience in high volume cooking. With all IIAS campuses conducting courses in Hospitality/Hotel Management, there is a Food & Beverage training lab and restaurant in each location. HM students are taught table setting, serving, arrangement, bar management, cocktail preparations and all other practical skills to do with service and operations pertaining to the hospitality industry. Hospitality/ Hotel Management students also benefit from the Housekeeping Lab which is designed as a mock up of a Hotel Suite Room. Students are taught the various skills of room arrangement, bed making, cleaning equipment handling as they would in a 5-star hotel or resort. This real-life practicals enable students to be prepared when they go for trainings and placement to larger facilities. Just as the reception or lounge is the first point of contact for guests at a hotel, IIAS campuses also have its own front office labs to train Hospitality and Tourism management students. Students are trained in different topics ranging from billing, guest relations, bell desk, concierge, communication and guest handling skills. The Cafeteria is located at the ground floor of IIAS Siliguri campus and top floor of IIAS Goa campus. Students and staff can enjoy a wide array of meals provided at reasonable cost. The open layout of the cafeteria also serves as a hang out point for discussions and interactions. Meals are served at set hours daily. Also attached to the cafeteria is a games room that provides students an ideal way to unwind during their free time. Equipped with Table Tennis tables, carrom boards and other gaming facilities it provides a cozy atmosphere to indulge in extra-curricular activities.